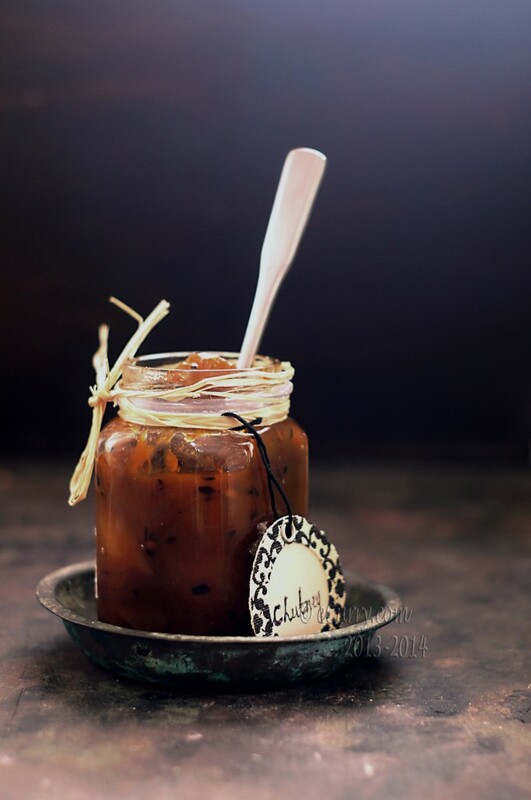 While the term “chutney” is observed upon as a condiment by the rest of the world, it plays a quite different role in Bengali cuisine. Chutney is an essential part of the multi-course Bengali meal. It is not a condiment, and it is not to be paired with meat or cheese. 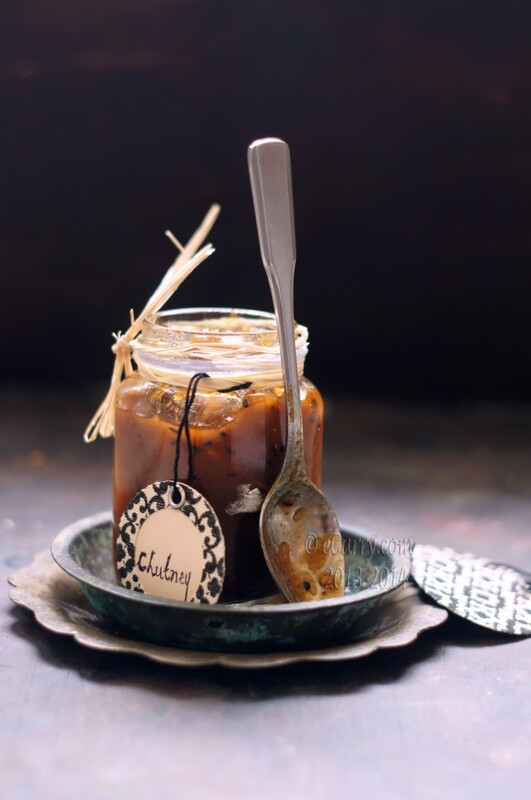 The chutney culminates a meal – wrapping up all other flavors with its own blend of sweet, tart with a hint of spicy. 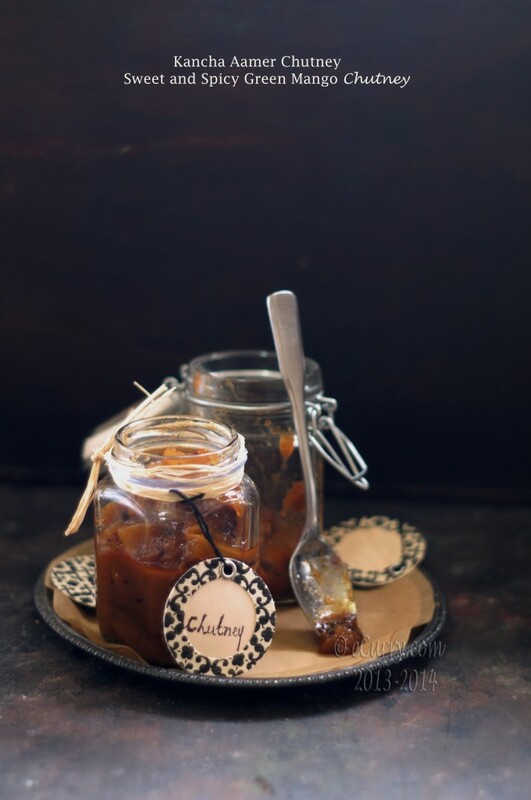 This Sweet and Spicy chutney is a versatile recipe and while is a treasure of a Bengali home, the chutney may be used as any other chutney is used in the western world. 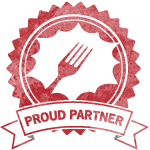 The amalgamated and varied flavors make it good enough to be paired with meat, cheese or served as a relish. It is also quite agreeable as a preserve and jam. The advent of spring is celebrated in every part of the world. New beginning, new colors and new promises. 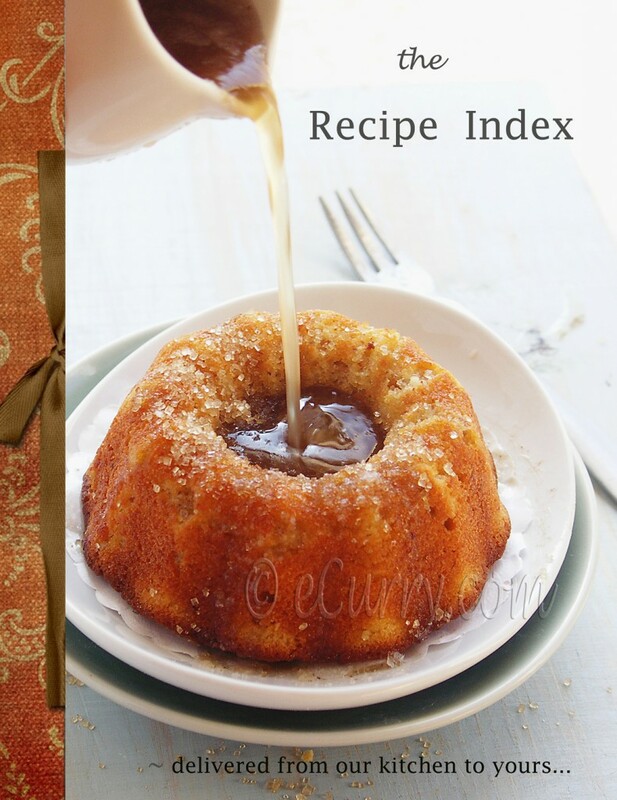 Today’s recipe is imbued with the spirit of spring – of my memories of home. Life warms up with the soothing sun rays, fragrance of flowers and incessant calling of the birds. The spring time is India is no different. The terrace of our home and our front yard would transform in to a dazzling riot of colors. The flowers would be tended by my maa, my grandma and my dad. The vases, tabletops corners of the inside filled up with fresh cut flowers and foliage. Along with the affirmation of many things, there is the hope to seeing the long awaited fruit and vegetables. 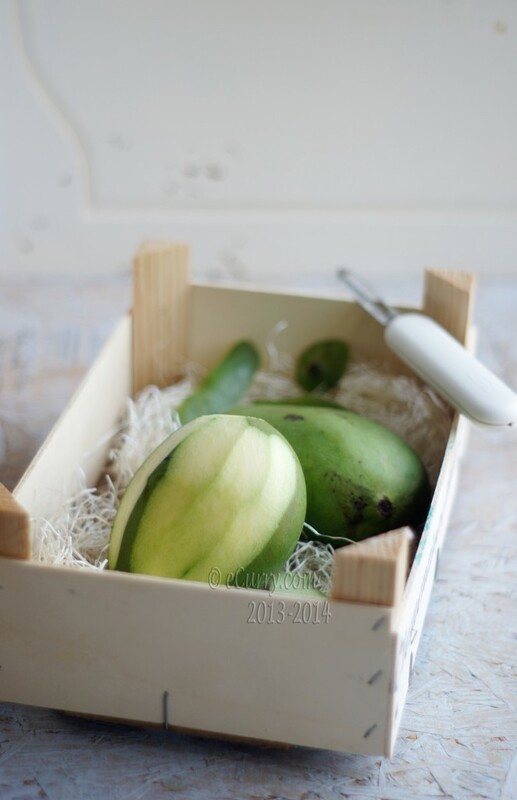 Mangoes obviously topped the list; raw and tart green mangoes that are usually sliced and pickled or simply relished with a sprinkle with salt and chilli pepper. While mangoes may be canned, stored and preserved with technology, the Aamer Mukul (Mango bloom) and the baby mangoes belong only to spring. 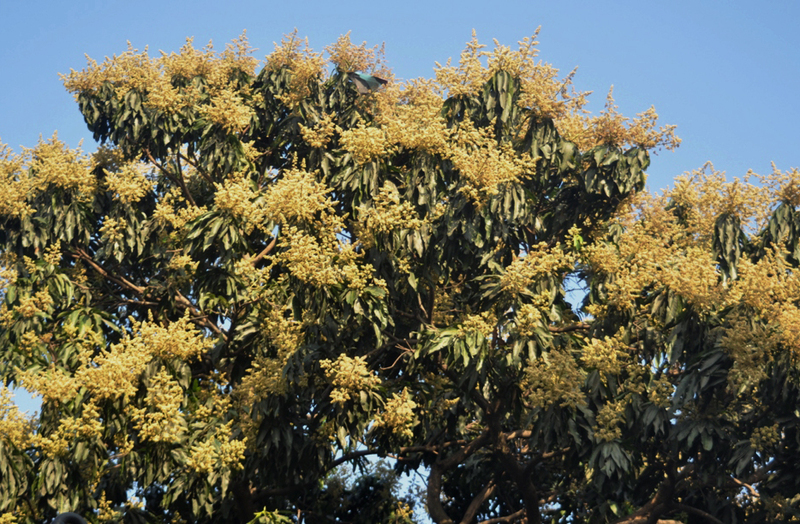 The swaying yellow flowers against the blue skies with their promises of the fruits inspired many poets in Bengal. 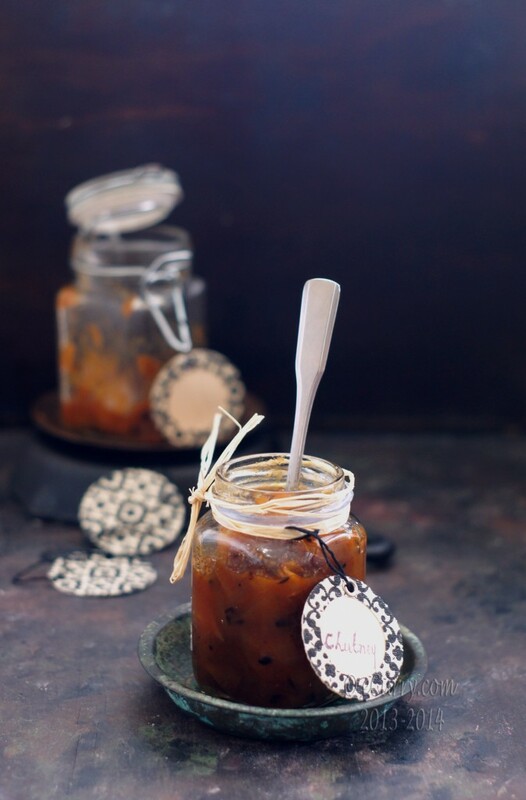 The word “chutney” comes from the Sanskrit word caṭnī, which would mean “to lick“. We lick it off our fingers and finish it with a chuckle. The recipe today is a popular one in Bengal and almost all homes make it with little variations. Raw mangoes are in abundance during spring. With sprawling Aam Bagan (Mango Orchards) in frequent corners, a lot of raw green mangoes are pickled and preserved. Jars and bottles of murabba/relish, chutney, and pickles start filling up the verandahs and courtyard of every home as they are sun-bathed to extend the longevity. Some of them are meant to last an entire year. Jaggery or gur (concentrated cane sugar) is used for the depth of flavors along with a blend of spices. The mango slices are simmered until tender and sticky, while the spices slowly infuse and the jaggery concentrates and sweetens. I love to have this chutney with hot steamed rice and masoor dal; a typical Bengali way to enjoy Aamer Chutney. 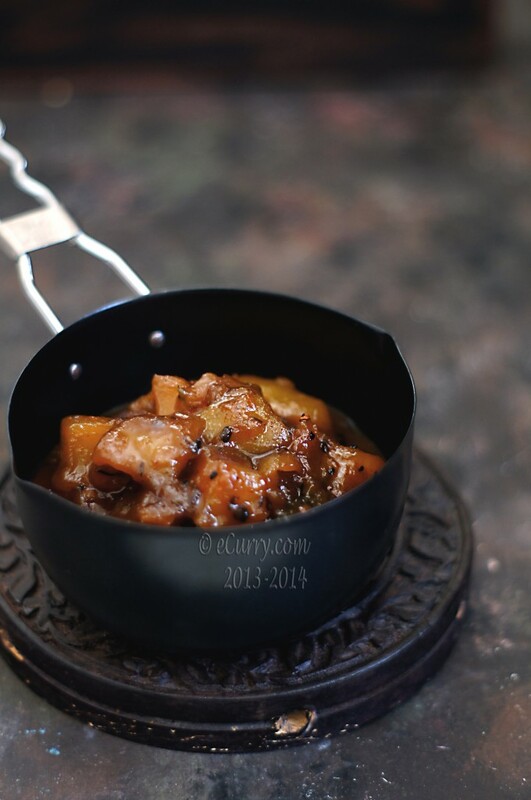 The caramelized sticky layer at the bottom of the wok once the chutney cools is morish and lip smacking good too. Scraping it off and then licking the spoon is another way to love this – something I would always do after a chutney was made at home and still do. Slice off the end of the green mangoes and soak them in water for about 30 minutes. 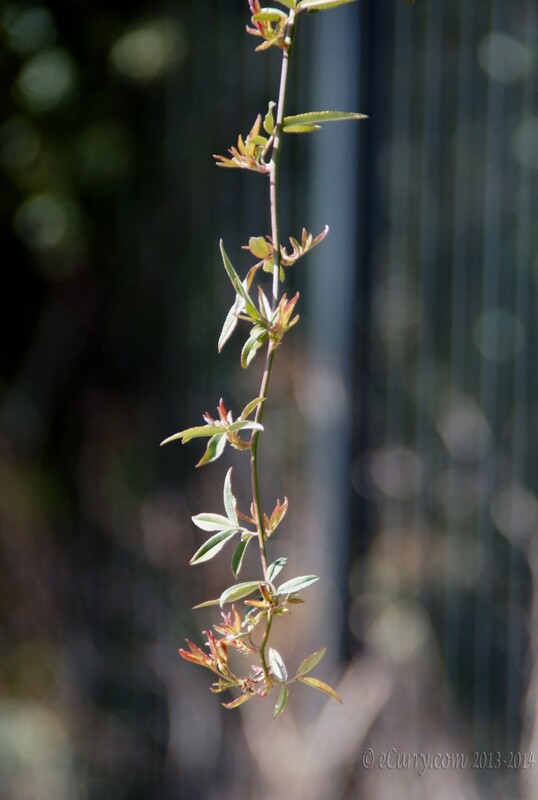 This reduces the astringency. Peel the green skin off the mangoes and slice them in cubes. If you want a mushy chutney with less texture, make smaller pieces. Toss the mango with about a teaspoon of salt and the red chili powder. Allow it to sit for about 15 minutes. In the mean time, dry roast 1 dried red chili pepper, 1.5 teaspoon of cumin and the cloves (ingredients in n. 10); each separately. Do not overcook. Remove from heat right when they start getting fragrant. 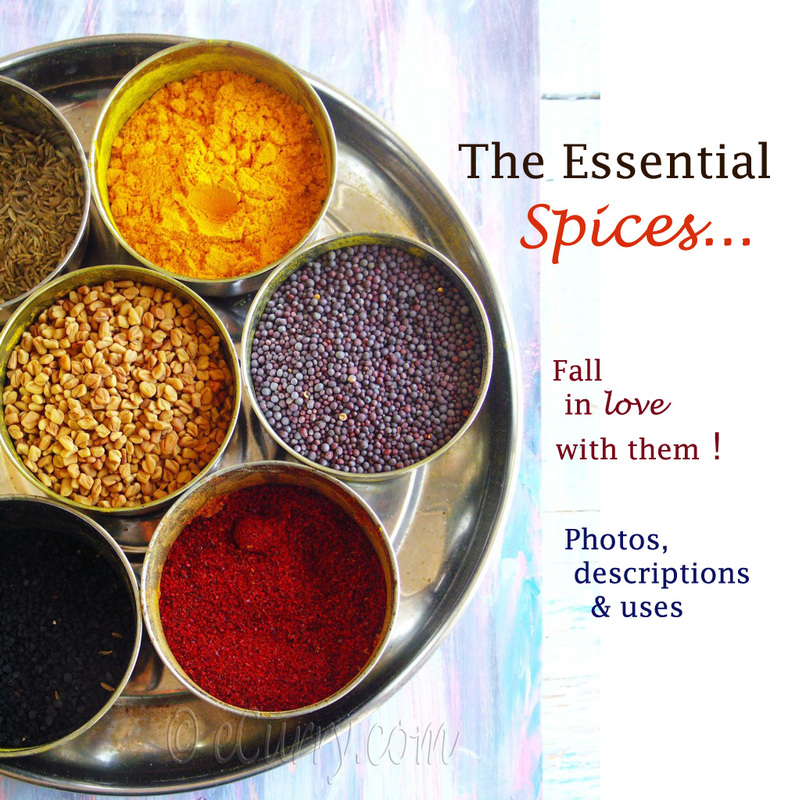 When cooled, grind all the roasted spices into a coarse powder. Heat oil in a wok/kadai/pan. Break one dried red chili in few pieces and keep the other one whole. Add to the oil (If you do not want the heat, keep both the chilli peppers whole and then once brown and the flavor is released, you may remove them from the pan). Allow them to sizzle and then add the teaspoon of panch phoron. When the spices sizzle, add the chili powder coated mango and toss well for the oil to coat the cubes and they are glistening. Cook for about 5-7 minutes. Add lime juice, a pinch of salt and the ginger powder, toss the mangoes for the spices to be coated well, reduce the heat and cover and cook for about 5 minutes. The mangoes will release some water and will cook. Now uncover and cook at low flame and when the mangoes are almost tender add the jaggery and if needed a splash of water to melt the jaggery. Keep stirring at low heat. The jaggery will start to melt and bubble and the chutney will have more liquid in it. Allow the mangoes to cook with the jaggery. When you have the mangoes tender (but not mushed up; they will be fork tender and tiny bit more) and the jaggery has reduced to where they coat the mangoes and there will be a little bit extra. Keep in mind that the thicker it is and lesser the amount of water, the longer it will last. The chutney will get a bit thicker in consistency once it cools. 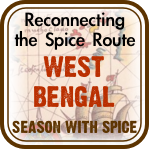 Sprinkle the roasted spice powder and toss everything together. Store cooled chutney in sterilized containers/glass jars and refrigerate. It will stay well for about a few weeks. A delicious looking! The flavors are amazing. I just realised koto ki we take for granted … oi aamer mukul er chobi ta ki shundor! Konodin mukul er chobi tolar kotha bhabi e ni! Chatni is definitely synonymous to licking fingers…quite dilligently. Agree with Sharmila…took so many things for granted. Seeing aamer mukul may be after a decade. Thanks for posting it. Lovely post conjuring the sweetness of spring in India. Love learning about about how chutney is a central element of the Bengali meal. Oh to have access to an abundance of mangos, green or ripe. Lovely post conjuring the sweetness of spring in India. Love learning about about how chutney is a central element of the Bengali meal. Oh tohave access to an abundance of mangos, or ripe. So true Sia. I had not planned this post, but he had sent me the photos some time back, along with the coconuts and the drumstick trees full of bloom and hanging drumsticks and also the flowers he grew. I know I will never make it to home for a vacation during this time of the year. Miss it so bad!! This is lovely. I’m going to make mango chutney from now on, instead of buying the jarred stuff. Oh, this looks wonderful! I will make your version of chutney now. I bet it will be delicious! Thanks for the fantastic post! 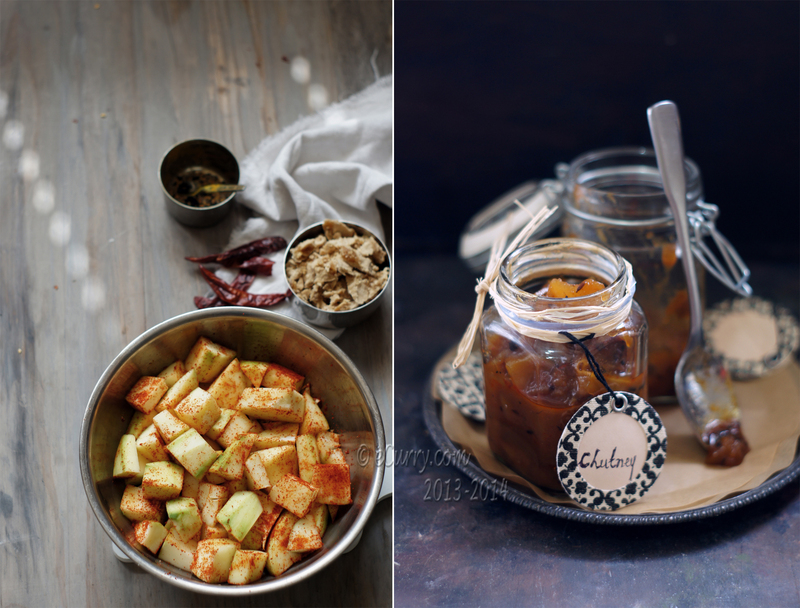 I am quite obsessed with condiments, and mango chutney has always been a favorite of mine. I’ve never had a green mango chutney, but I’m going to have to try it out now that you’ve tempted me with all of these lovely photos! Milagai Saandhu:Sigappu Milaga Chutney. Milaga Chutney / Thokku. Can you believe it, red chilies have more Vitamin-A than an orange. So, load up red chilies next time when you shop. At the same time, I need to alert you…too much of spicy food will lead to gastric-ulcer, watch out. Seriously, I can’t bear the heat but loved the idea of fresh red chili chutney…so slightly tweaked the recipe my way. Yes, used Jalapenos instead. One could also carefully avoid seeds and remove the inner pith to avoid excess heat. Hmmm, chilies have their heat in veins, definetely not in the seeds or the flesh! So get rid of the inner pith!Ingredients:Ripe Red chilies (I used Jalapenos tho’)Garlic 1 whole head, gratedRock SaltTurmericSesame oil few spoonsMethod:Heat oil, in a wok. 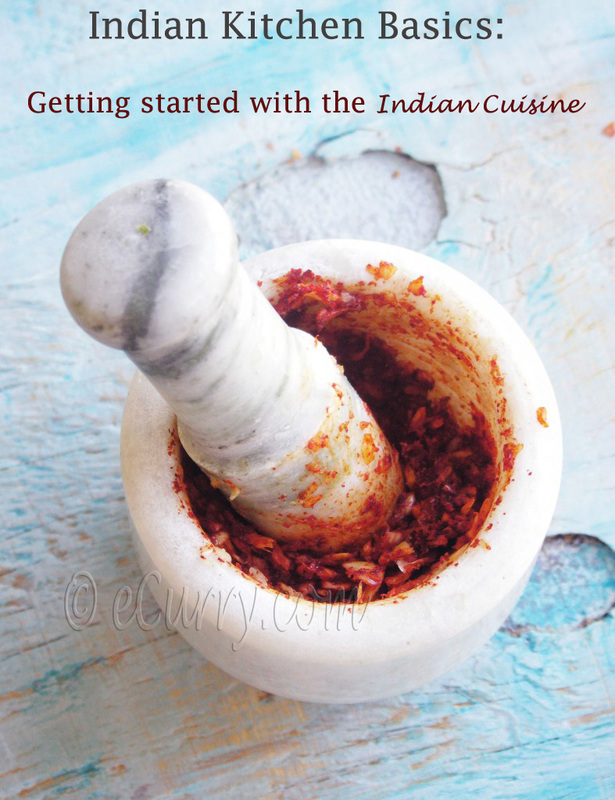 Add garlic, salt and chopped red chilies…saute for few minutes.Grind them coarsely. Serve to go with your Barotta, Idly or dosa. 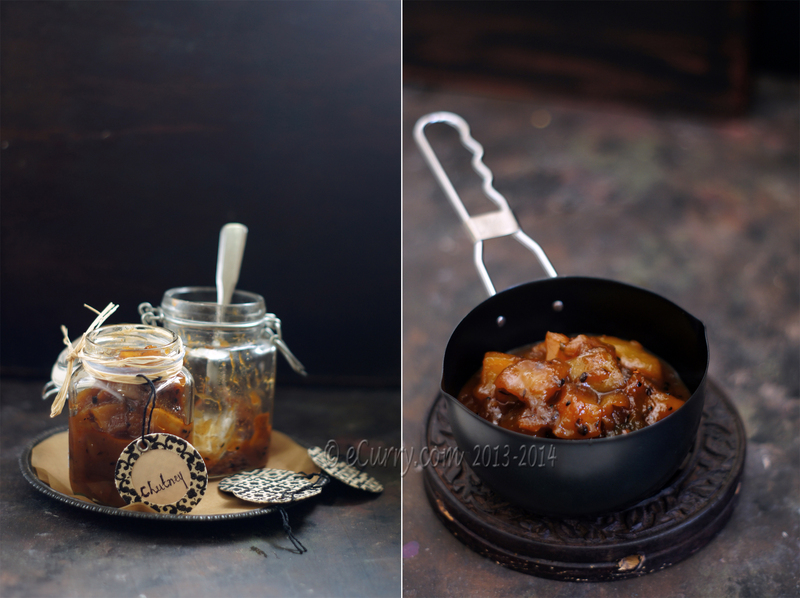 I haven’t made the mango chutney yet, but I just wanted to say how happy the pictures made me and the writing. It is a lovely post. I wish I could go to India, right now. This chutney is very similar to one that I make, except mine uses fresh ginger and I use a touch of amchar to add a touch of sourness instead of lime or lemon, I find it works better with the green mangoes. I also put my jars in a boiling water canner for 45 minutes, as this ensures shelf life of years. Very nice with any cold roast meat or good cheese, and especially wonderful on baked brie spread on good bread. this recipe actually says 2 mangoes!! I would think on an average one mango is abot 300 g… approximately. I used pretty large mangoes. I hope this helps you calculate how much you would want to make and how much you need to use magoes from your yard.